Almost everyone loses fullness from their temples as they age. The loss of youthful fullness begins in our mid-30’s and progresses from there. In many people this atrophy results in noticeable depressions or “skeletonization” of the temples. Women can hide the area with their hair, so the defects go unnoticed. With aging, not only does the fullness decrease, but also the skin gradually thins enough that unattractive blue/green veins become visible. 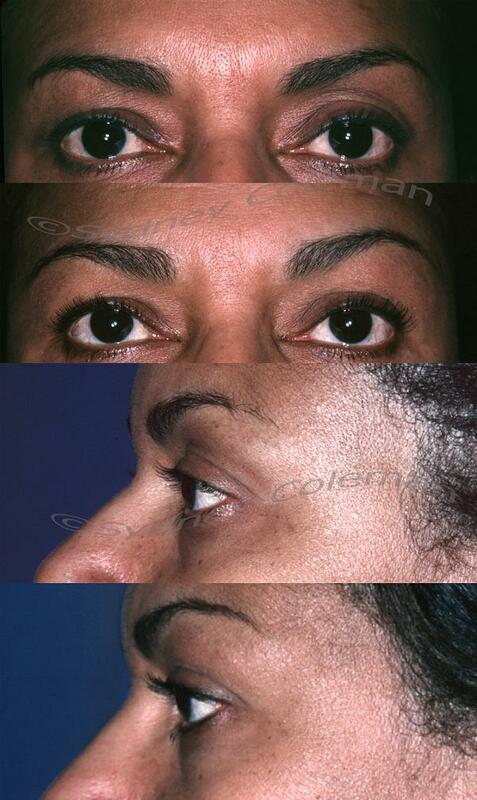 With the accompanying loss of fullness in the brow, the lateral upper eyelid and eyebrow begin to droop. Restoring fullness to the brow lifts the outer eyebrow to a more youthful level. In addition, the fuller temple makes the outer eyebrow more visible, giving the eye a much more open, attractive and youthful appearance (see photos below). Fat probably through new collagen formation, improves skin thickness and quality over time to hide the tortuous, obvious veins of the aging temple. By filling in the temple hollows, adjusting the curvature of the outer eyebrow and improving the quality and thickness of the skin, LipoStructure is the best way to rejuvenate temples. Before (left) note tortuous veins and the outer eyebrow “hidden” in the temple. Middle picture is 4 months after one infiltration. The new fullness of the temple and brow raises the outer eyebrow and exposes more of the outer eyebrow. The skin continues to thicken with time, and the veins are hidden under the thicker skin (right). 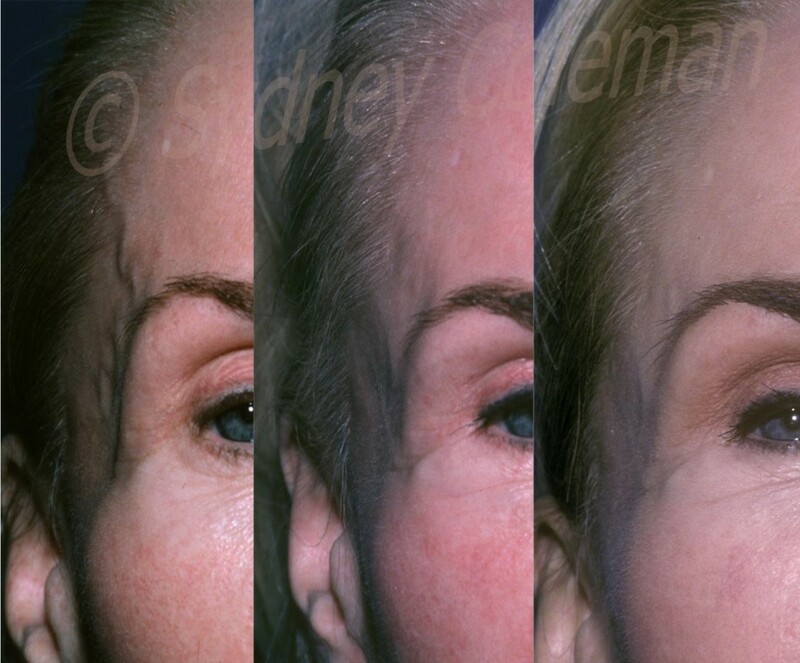 Many of us will develop a hollowed-out, somewhat skeletal appearance in the brow/upper eyelid area as we age. It is also common for those who have had upper lid blepharoplasty in the past to have had too much fat removed, and for this same hollowed-out look to be an unwelcome result. The upper eyelid/brow area of a young person is soft and full. Placing fat into the upper eyelids and below the eyebrow will make the eyes look more youthful, and the patient more rested and healthy. Before and 3years after placement of fat into her upper eyelids and temples. 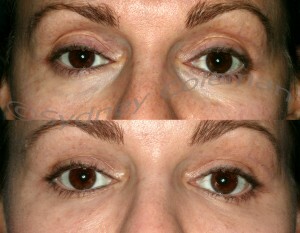 While softening the hollow upper eyelids, filling the area makes the eyebrow look higher. 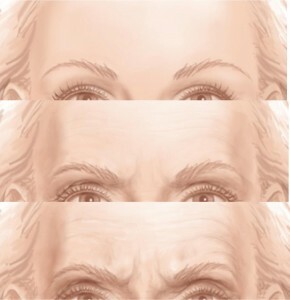 Placement of fullness into the temple makes her outer eyebrows more visible. The acne scarring has also improved.16 months after the addition of a subtle amount of fat grafts to the left upper eyelid. 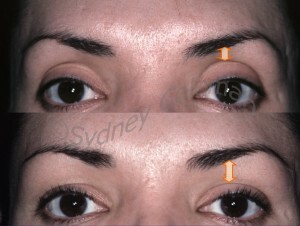 Filling of the area below the eyebrow tightens the loose wrinkled upper eyelid skin. Structural fullness into the temple and outer brow raises the outer brow and makes it more visible from the front view.